One of the most common starships within the Imperium is the tested and tried Type S scout/courier. Originally produced to specification for the Imperial Interstellar Scout Service, this sleek and simple ship was intended for common courier duties within the Imperium, and simple survey and exploration duties beyond the Imperial borders. Aliens of the Imperium adds 19 new Captains Cards and 1 new Adventure Card, expanding on some of the alien races inhabiting the empire. A set of twenty premium high-impact solid plastic tokens. Two packs of fifty (50) card sleeves. Clear front, solid art back. 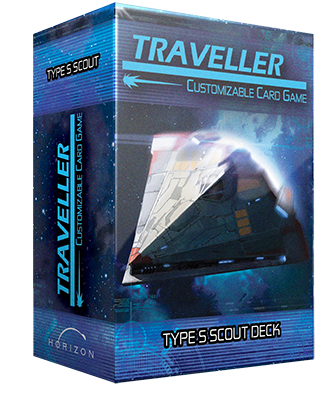 The Beowuld Free Trader Ship Deck includes a rules insert and 81 cards. The Empress Marava Far Trader Ship Deck comes with 81 cards. The Subsidized Merchant Ship Deck includes a rules insert and 81 cards. Trouble on the Mains, the first expansion pack for the Traveller Customizable Card Game, adds 20 new Captain’s Cards with a specific focus on Piracy and combat.